There are several important things to consider when thinking of ways to take care of your sprinkler system, your property, your water, and ultimately your money. One thing that we feel very strongly about is educating people about who legally can and can’t work on your sprinkler system, as well as what goes into becoming a Licensed Irrigator. By knowing this information, you can potentially protect yourself from poor quality work and work that is conducted illegally. In the State of Texas, it is a criminal misdemeanor for someone to install or even repair an automatic sprinkler system unless they are licensed by the Texas Commission on Environmental Quality (TCEQ). Some exceptions to this include a licensed plumber, licensed professional engineers or architects or landscape architects, someone under the direct supervision of a Licensed Irrigator, or a homeowner on the homeowner’s property. There is more to getting and keeping a license with the TCEQ than just filling out paper work and paying a fee. The TCEQ requires that all licensees are educated and professional, and remain educated and professional throughout our licensed time. They also have to pass a criminal background check each time their license is renewed. If you are unsure if your sprinkler guy is licensed, simply ask them. They are required to have their license card with them at all times. In addition, their license number should be displayed on their truck as well as on any form of advertising or communication, i.e. website, emails, mailers, business cards, coupons, etc. Additional information regarding the irrigation licensing process can be found on the TCEQ website at http://www.tceq.state.tx.us/licensing/irrigation/landscape.html. 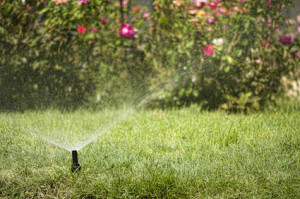 At the end of May, the North Texas Municipal Water District (NTMWD) announced that they would extend Stage 3 watering restrictions, watering once every two weeks, through the end of the summer, to all residents of Plano. If you have any questions regarding watering schedules and what is or is not permitted, please visit your city’s website or give us a call. We’d be more than happy to help you out!